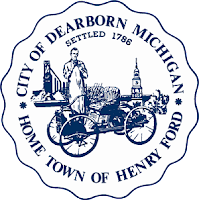 Dearborn Recreation & Parks Dept. 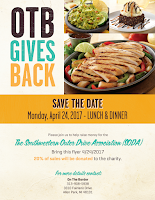 Bring a copy of the flyer and 20% of your purchase will be donated to the Southwestern Outer Drive Neighborhood Association. Donations will be used to help offset the cost of our events like the Easter Egg Hunt and community support like the First Responder Appreciation. 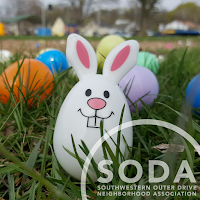 This years SODA Easter Egg Hunt was the biggest yet!! We had a record turn out (200 Kids), a record number of donations and the best weather yet!! We want to thank everyone who came out, everyone who donated items and everyone who donated their time. Without these people and businesses, these events could not happen. SODA thanks you for your generosity!! 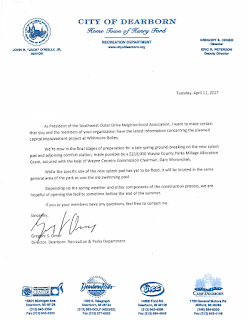 We received an update letter from Recreation & Park Dept. 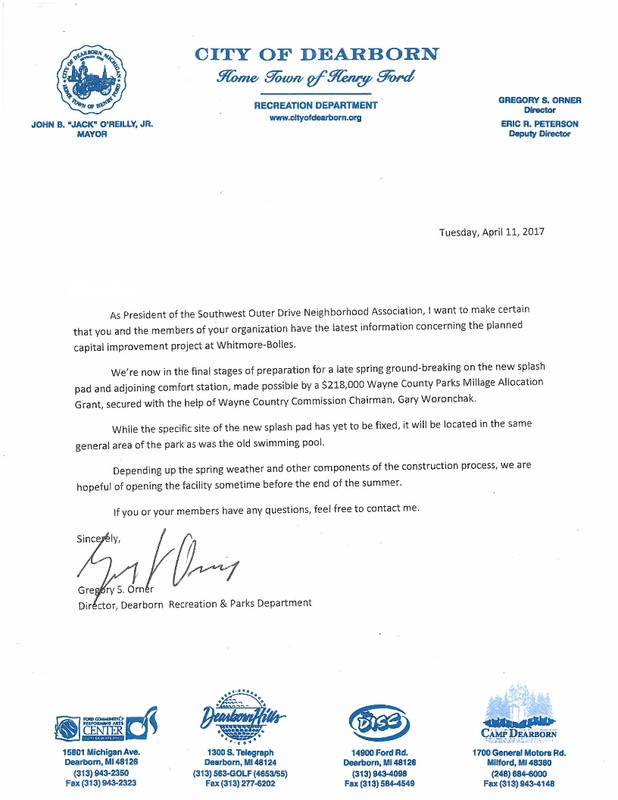 Director Greg Orner regarding the Whitmore-Bolles Splash Pad. As President of the Southwestern Outer Drive Neighborhood Association, I want to make certain that you and the members of your organization have the latest information concerning the planned capital improvement project the Whitmore-Bolles. We're now in the final stages of preparation for a late spring ground-breaking on the new splash pad and adjoining comfort station, made possible by a $218,000 Wayne County Parks Millage Allocation Grant, secured with the help of Wayne County Commission Chairman, Gary Woronchak. While the specific site of the new splash pad has yet to be fixed, it will be located in the same general area of the park as was the old swimming pool. Depending up the spring weather and other components of the construction process, we are hopeful or opening the facility sometime before the end of the summer. 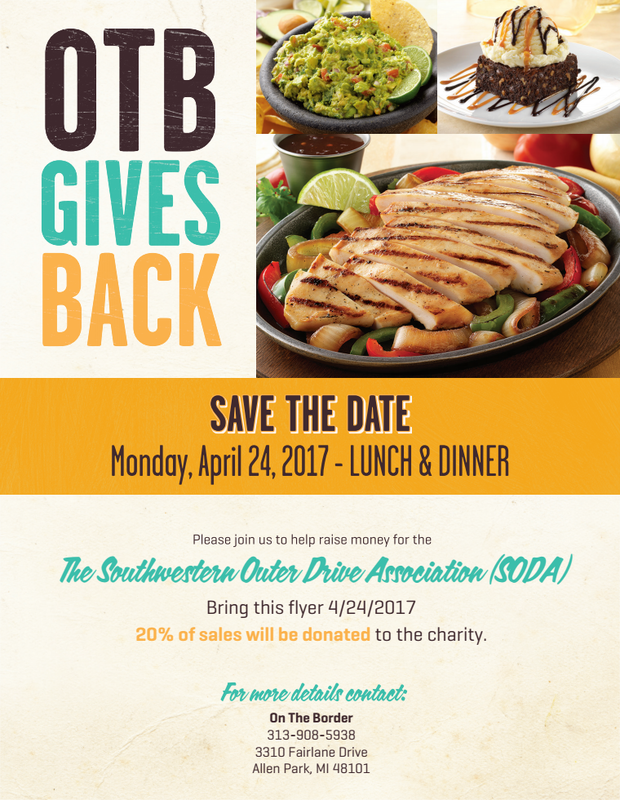 If you or your members have any questions, feel free to contact me.